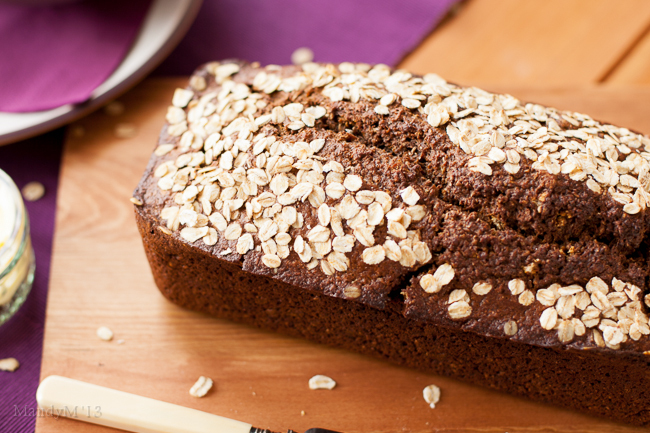 Guinness Quick Bread — What the Fruitcake?! Before I even get into this week's episode of GIBO or my recipe, I just have one small thing to say. I'd been keeping a nervous eye out for the finalist list to be published for the category of Best Food/Drink Blog which I'd made the shortlist for, and I'm not saying this just to say it, I honestly wasn't expecting to see my blog's name make the list. There were so many brilliant foodie blogs on the shortlist that I didn't think too much of my chances. But come Monday night when the finalists were announced, there it was, "What the Fruitcake". 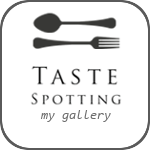 I had to keep checking the list just to make sure that my blog was indeed one of the five listed in the Food/Drink category! When I started my blog a little over five years ago, it was started as a simple pastime, something I could do while getting my bearings in a new country and home. I didn't have any friends here, and because I wasn't working, not many opportunities to meet people. But one of the first acts of kindness came from one of my neighbours. I had mentioned in passing that I liked to bake, and although we had hardly seen each other since the first time we met, one day out of the blue she gave me some apples that had come from another neighbour's tree. I hopped from blog to blog until I found a recipe I liked and those little apples ended up being delicious apple turnovers in home made puff pastry. I walked straight over to her door and gave her a few hot out of the oven. She invited me in for tea and that was how I ended up with an adopted Irish mum. I'm not going to carry on waxing poetic, because I'm definitely not poetic, but I will say that being able to share stories like that one, and even ones that don't have deep meaning or significance in my own personal history, is what I love about blogging. And yet at the same time it's quite daunting. Putting any work or thoughts or ideas out there in public to be open to any and all criticism is sometimes a little scary. And then you hear that you've been openly commended in a not so small way for those stories. It's just amazing. I'm absolutely flawed and so incredibly happy that I've been named a finalist, so thank you to those of you who nominated my blog. I hope that my stories can bring a smile to your face and possibly even start new friendships. What the Fruitcake?! is my offering of apples to you and I hope you come back with a gorgeous treat hot out the oven that you want to share with me in return. I'll put the kettle on. Ok, before I pass out from lack of oxygen from all of this frantic excitement; it's week three of the Great Irish Bake Off! But before the spoiling begins, here's my recipe inspired by this week's episode. This week we switched back to having a Signature Bake and a Technical Bake challenge, and the theme for episode 3 was "Bread." The signature bake had the contestants do, not one, not two, but three breads! Is that the definition of a bread basket? Three breads or more? Whatever the case, three was the lucky (or unlucky) number for our remaining ten contestants. Thankfully, the Signature Bake breads were mostly quick breads, and this is where I took my inspiration for my own loaf. Quick breads are relatively... quick, and quick was just what I needed after ending up with a chest infection last week. Nasty stuff, but I'm enjoying writing these posts way too much to let a bit of wheezing get in my way. If you're not sure what I mean by a quick bread, here's a not-so-scientific-but-kinda-simplified explanation. (Normal) Bread = flour, water, etc. and the all important ingredient of yeast in some or other form. Ingredients + yeast = a few hours of rising time at different stages of preparation to let the little yeasty critters do their job and get gassy, which in turn, helps create light and fluffy bread. This is not a quick process. Quick bread, on the other hand = flour, water etc. and a simpler raising agent which is normally baking soda. Ingredients + baking soda = mix all the ingredients together, batter/dough goes into the pan, and the whole lot is thrown into the oven shortly after. The raising agent does a somewhat less efficient job of helping the batter rise, so no light and fluffy, but instead you get a more dense and heavier loaf of bread. But, no hours of kneading and rising, hence the "quick" in quick bread. Don't get me wrong, I'm not knocking baking soda as a raising agent in bread, it simply helps create a very different loaf, one that certainly is just as tasty. Think banana bread, spiced pumpkin bread, soda bread or even tomato and cheese bread. Some are moist and more dessert-like, the rest are savoury and perfect for dunking in soup or mopping up remnants of a stew. Okay, technical/sciency/baking dark arts and magic stuff done with. I've been wanting to bake my own Guinness bread since I had my first taste of it way back when. I think it was with a Guinness stew in the Guinness Storehouse restaurant after the mandatory tourist visit before I moved here. It's heavy and rich, I want to say chewy, but that's not quite right. Doughy isn't right either, and doughy is not a good thing. It's... something you can sink your teeth into. Yeah, that's it. The bitterness of the Guinness disappears completely because the flavour is sweetened by the black treacle, also something a little more on the bitter side, but when they combine with each other and the nutty flour and sweet oats, you can taste the unmistakable rich flavour of the Guinness, but it's smooth and sweet and just lovely. This bread is the perfect thing for a lighter or creamy soup. Something like potato and leek or brown onion, even mushroom. I can't wait to make another loaf and have it accompany an Irish stew. Honestly, I've been looking for lame excuses not to bake another loaf just because I know I won't be able to ration it out sensibly. I can't take any credit at all for the recipe. No tweaks. No changes. Well, maybe a tiny change, but nothing that I can now say this is my very own recipe. I've been on an ancient grain kick so I'm throwing spelt flour into everything. I did a 1:1 swap of normal wholewheat and white flour and simply replaced them with wholegrain and white spelt flour. Oh yes, I also topped my loaf with a sprinkling of raw oats. I just like the way it looked. I'd initially wanted to shape the loaf like a round soda bread, cross included, but boy did I get a fright when I mixed my batter up, which, incidentally, takes all of 5 minutes. I honestly thought I'd read the recipe wrong or had weighed and measured incorrectly. I had a batter. I'm talking a thin pancake-like batter. It wasn't pretty. 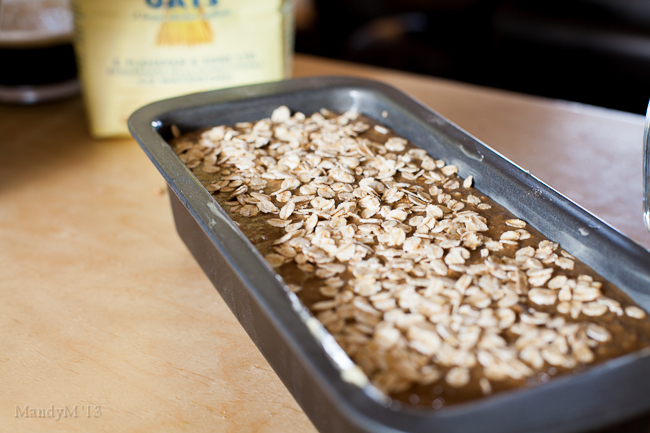 All chunky with oats and completely runny. I almost thought I'd throw it out and start again because the recipe says you get a thin dough. Dough. Not batter. This was, of course, my fault. You're supposed to use less liquid when baking with spelt flour. But I'm a little reckless at times, a real baking maverick, I poured it into the tin and popped it in the oven anyway. Granted, it wasn't baked in the 40 minutes the recipe promised, it took more like 70 minutes, but out came a perfectly baked, moist, thick, tasty loaf of bread. Whoop! Actually, my bread tin wasn't quite big enough for the recipe, so I ended up doing a loaf and then pouring the rest into a 7" round springform pan and baked that along with it, although for a bit less time. I'm so very glad I had that extra round "loaf". While I patiently waited for the actual loaf to cool, Andrew and I devoured the other bread. It started off with just an eighth each, just to taste, with a bit of butter melting in. Next thing there was only a quarter of it left. I'm telling you, warm out the oven with nothing but a smear of salty butter, that's the way to do it! But if you're somewhat more self controlled than us, let it cool and eat sensibly. Like grownups should. And now, episode 3! It's all about the bread, baby! Like I said earlier, this week's show went back to the Signature/Technical combo. The contestants were given 2.5 hours to make three loaves! This week, I was particularly interested in Bridget's Soda Bread with Potato, Onion & Cheese, Tom's Nutty Loaf with Black Treacle & Spelt Flour (yay spelt flour! ), Maryanne's Pear, Irish "Parmesan" & Thyme Bread and Stephen's Yeasted Mango (and all sorts of other fruit) Plaited Tea Loaf. I noted that a lot of the contestants all said the same thing, it was the first time they were trying a specific ingredient. I have to wonder if the ingredients were provided for them, as no one in their right mind (me anyway) would walk into a competition and use unfamiliar ingredients in a recipe. Tom also said he’d never managed to get a good rise out of his Soda Bread recipe. Ah, Tom! So then, find a new recipe! Don’t think it will rise beautifully on the day when it never has before. A coincidence or just pure chance, Stephen’s stout loaf took longer than an hour to bake which he didn’t expect. I had the same experience with my Guinness loaf, so I have to wonder if all stout recipe writers are actually trying to sabotage us home bakers in the hopes that we’ll buy our stout loaves instead. When the finished loaves were revealed, Maryanne's Pear & parmesan loaf was baked perfectly and Paul loved the taste. He said he could taste the parmesan from the first bite. That's my kinda bread! Aoife's Apple, Cinnamon, Pecan & Toffee tea loaf was an instant hit. Paul seemed quite animated as he commented on the inside of her tea loaf. He loved that all the components were evenly distributed around the loaf and the flavour was a home-run. Biddy gave a thumbs up because it’s rude talk with our mouths full of delicious sticky sweet goodness! Jarek’s near full Irish (with the strange inclusion of basil) also seemed to hit the spot. Biddy said all you’d need to do to complete the meal was serve the bread with a poached egg. Good thinking Biddy! Tom was the first contestant to be disappointed with his bake. His Onion & Rosemary Soda Bread was dense and somewhat doughy in the middle. See, what did I tell you, get a new recipe! Looks like you've got a dud one there! Bridget also didn’t start off well. Her tea bread was completely soggy inside. I wouldn’t even say it was a case of underbaking, I think there was just too much fruit, which she’d added water to by poaching, so they just released their juices and made a soggy mess of her loaf. I thought Stephen’s tea bread was a little disappointing. It wasn’t evenly baked, with one side quite a bit darker than the other. Paul said that it could have done with a bit more proving, but I would say that, quite possibly, it was over proved. It spread sideways instead of rise up, which is normally a sign of over proved bread. Stephen had commented before putting it in the oven that it was the biggest he’d ever seen it, so I’d say that might have been the cause of a poor rise. I want to comment on all the good bakes in this round, but I’d be writing for Ireland if I did. 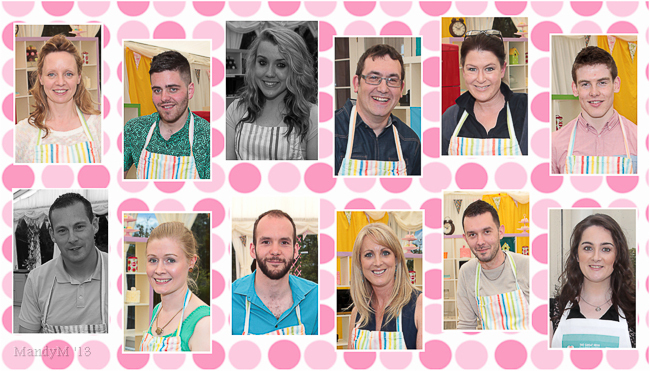 Most everyone had brilliant bakes with so many interesting and delicious flavours and combinations of ingredients. Paul & Biddy were simply giddy by the end of it. Will’s incredible looking Olive & Garlic Soda Bread, Steve’s Lemon, Walnut & Blackberry Teabread and many more. On to the dreaded Technical Bake! Tom was right on the money when he speculated that the challenge would probably involve them having to make a lot of it and have them all in a uniform shape. Paul decided this week’s challenge would be his own “Party Bread” which is a yeasted loaf made up of individual buns that bake together for you tear & share. When the ingredients were revealed, the contestants found 7 different toppings like linseed, sesame, poppy etc. which would top each bun in whatever way they chose. Oh, and did I mention that they were given fresh yeast to bake with? Fresh yeast is actually no more scary to bake with than dried yeast, but if you have only ever used dry yeast before, the idea of it can be quite daunting, especially if your place in the tent relies on it. During the manic baking, one of my favourite quotes came from Bridget, “Yay, it’s rising! People are dying all over the world and I’m delighted with my yeast.” Right you are Bridget! Everyone seemed to get on quite well with the Technical Bake. This was actually a bit of a "boring" episode in that there weren't any major disasters like last week or the week before. The contestants just seemed to get on with it. Once all lined up in front of the judges, the breads were all very similar to each other. The only subtle differences was the height of some of the loaves. Overall, they all looked brilliant. Aoife's loaf was beautifully proved, Paul’s only comment about it was that some of the seeds were down the sides. A very good start to the lineup! Bridget's was also beautifully proved and perfectly baked, removing her from the Underbakers Anonymous group. But her buns weren’t quite uniform and, again, Paul wasn’t happy with the seeds going down the sides. I guess Paul just doesn't like those seedy loaves slouching around the place all dodgy and stuff. Maryanne had even buns and her toppings were just right. And more importantly, it was well proved with great texture & flavour. Paul didn’t like Tom’s double dipping of toppings and his loaf did look a little more messy than some of the others. He also had some uneven bun sizes. Okay, you may start downing a shot every time I write the word "buns". Mmmmm.... hot soup & warm Guinness bread. Stephen's loaf looked to be the tallest. A very good rise and the judges were very happy with the flavours. But, alas, he was also a double dipper. Steve didn’t have a good prove and his buns were uneven, I’m sure he was wishing he’d weighed all his dough balls now. From where I was sitting as a viewer I would have struggled to give these loaves their places, they were all very close to each other in terms of appearance, bake and taste. Brilliantly done for the daunting task of yeasted bread. Steve Tydell came in tenth, while it was a tough choice between Aoife and Maryanne for first place. But Maryanne proved herself and walked away winner of the technical bake! Well done Maryanne! Your Party Bread looked amazing! Although Stephen was just happy that he was in the top half of the technical bake, he walked away with the title of Star Baker. Anna scared the living daylights out of the contestants by starting off her goodbye spiel by talking about a double elimination… in the future… but this week only one baker was sent home. I must say, I was very sad to see this contestant go home. I’ve been enjoying his banter on Twitter & Facebook, and he’s just a very likeable person on screen too. That person was Tom. I’m actually genuinely sad as I write this, I can only imagine what the bakers themselves felt. Keep baking, Tom! And do send those loaves on to Biddy & Paul, in fact, send some to me too! Posted on October 3, 2013 by Mandy Mortimer and tagged GIBO Great Irish Bake Off Guinness Guinness Bread Black Treacle Wholemeal Soda Bread.